Dr. Anno is certified as an acute care nurse practitioner, a cardiac device specialist and an electrophysiology specialist. He has certification in cardiac medicine and is a registered cardiac diagnostic sonographer. 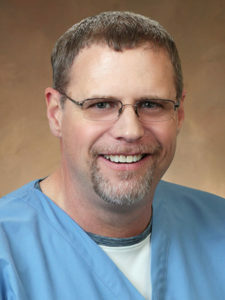 He earned a Doctor of Nurse Practice from Walden University in Minneapolis, Minn., a Master of Nursing Science from Washburn University in Topeka, Kan., and a Bachelor of Science in Nursing from Fort Hays State University in Hays, Kan.
Dr. Anno has been practicing nursing since 1987, and he specializes in cardiology and electrophysiology. He serves adults at our Olathe Clinic.